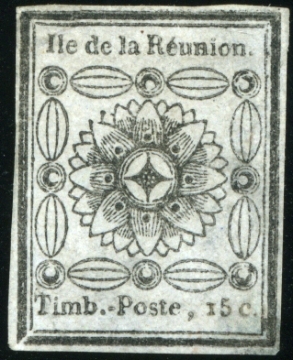 Réunion, 1852, 15c. black on blue, unused without gum as issued, good margins all around and except for some smaller repairs in good condition and of extremely fine appearance. This are the first stamps ever issued in a french colony, they were printed by a setting of four clearly different types (each type being listed separately in the Dallay catalogue), this single comes from type four of which ONLY 8 UNUSED EXAMPLES ARE RECORDED BY J.F.BRUN. A major rarity of the French Colonies. 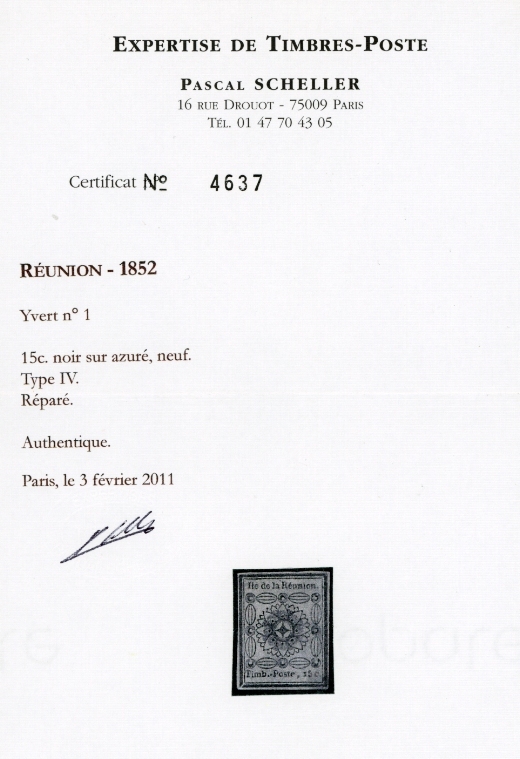 Certificate Pascal Scheller; Maury-Cérés-Dallay catalogue # 1 IV = 46.000 Euro.